Often people are unsure about the size of things so here is a short guide on paper sizes as a useful reference courtesy of Paper Sizes. The dimensions of the A series paper sizes, as defined by ISO 216, are given in the table below in both millimetres and inches (cm measurements can be obtained by dividing mm value by 10). 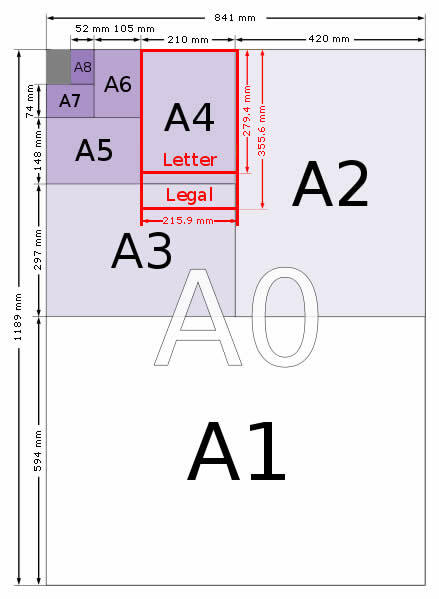 The A Series paper size chart to the right gives a visual explanation of how the sizes relate to each other – for example A5 is half of A4 size paper and A2 is half of A1 size paper. To obtain paper sizes in centimetres, convert mm values to cm by dividing by 10 and in feet by dividing inch values by 12. A Series Paper Sizes Chart. Image courtesy of Office 365.